I love this and I “need” it. Love her!!!! 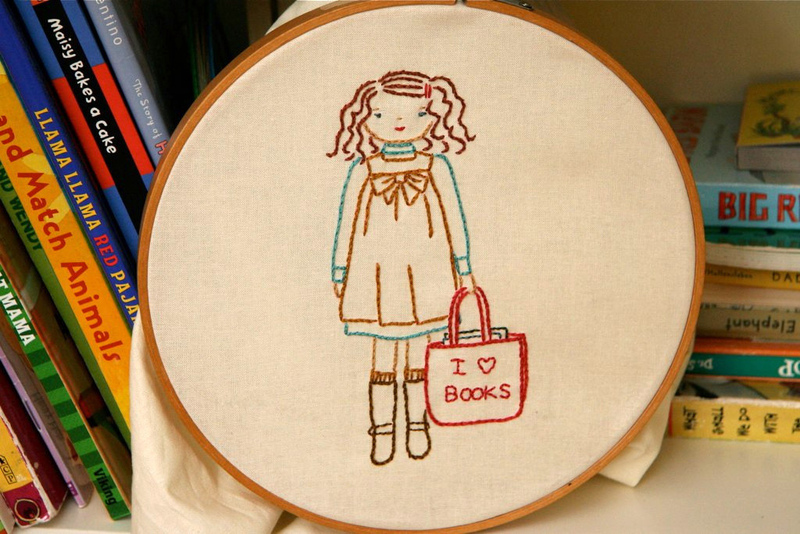 She’s all done, ready for a trip to the library…. Oh, I love it! This was so “me” as a child, but with braids instead of curls, LOL. I heart books too! (and was thrilled to renew my books online today). How is it possible that each one of these is cuter than the last? Adorable. I am going to have to buy them all. Soon. 🙂 It seems like it would be a great project to do while relaxing at night in front of the tube (instead of incessantly playing solitaire on my iphone). Do you have any recommendations on type of fabric to embroider on or embroider thread? Are some better than others? I am clueless. This teacher librarian says Yeah! Semi-unruly hair, knee socks & a bag that says I <3 books!?!? You made 12 year old me!! I shall buy this and add glasses for realism! Oh what a great idea! Family portraits in embroidery! Thank you for awesome things!!!! Hmm, yes, I was just thinking glasses would be adorable too! ooooooh. i really like that one! cute! I use regular 100% cotton and DMC floss. If you go to a needlework shop they’ll have fancier choices but I’ve always had luck with these.